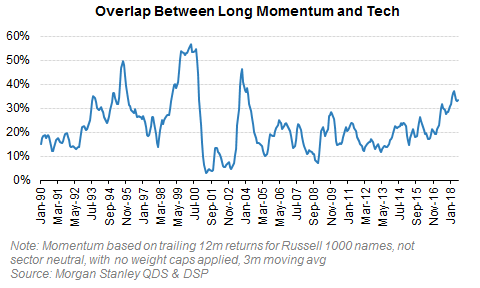 Many investors have said ‘it’s different this time’ about Tech stocks over the last few years, and so far they’ve been right – despite numerous warning signs of Tech, growth, and momentum being crowded, these stocks have continued to go up and dips have meant to be bought. Looking over the last 5 years, selloffs like that seen over Thurs/Fri last week (-2.8 sigma event) have been a good signal to buy Tech, momo, etc. But it’s likely different this time. 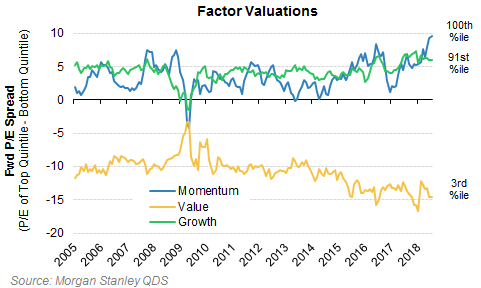 First off, MS Research lays out the case why Tech and growth are at risk – these stocks have not derated with the broader market and look rich relative to future expected earnings growth. 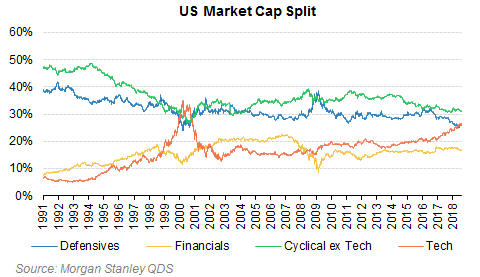 There is also the well discussed crowding in Tech. The crowding hasn’t mattered so far as there has not been a fundamental catalyst to unhinge it, but recent Tech earnings may well be that catalyst. You can’t have a >$100bn loss in a well held name and not have collateral damage. 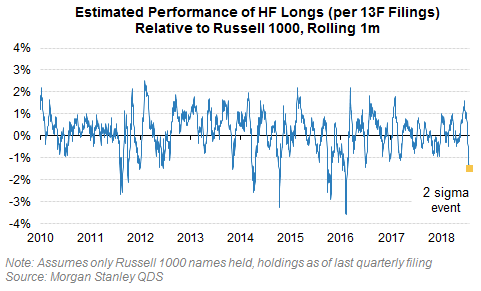 A coarse estimate of the performance of HF longs based on 13F holdings shows the last few weeks have been a ~2 standard deviation loss event, and more actively held Tech stocks vs more passively held Tech stocks suffered a 3 sigma drawdown last week. While many times big losses have preceded bouncebacks, note that in Aug 2011, April 2014, Feb 2016 the pain got worse before it got better. While some derisking has occurred already this summer, there easily could be more to come. 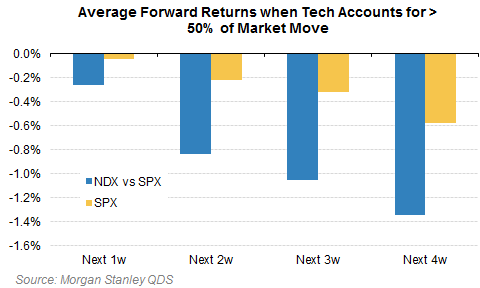 The risk to the broader market of any Tech weakness is high as well. 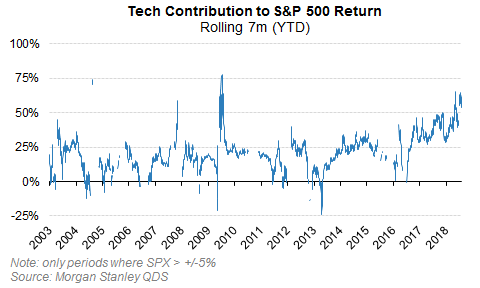 Tech accounted for 65% of the S&P 500’s gain YTD going into last week (55% now), near the post Tech-bubble highs and an unsustainable pace (Tech’s weight in the S&P 500 is ~26%, also a post Tech bubble high). 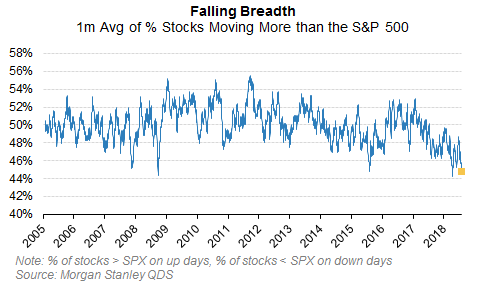 And a different measure of breadth – the percent of stocks moving more than the S&P 500 – is near ~14 year lows, indicating an increasingly small proportion of stocks are driving the overall market. 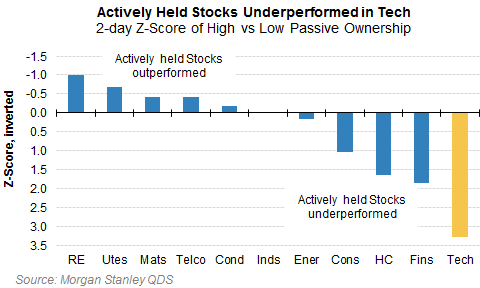 If those stocks (Tech) crack, there will be much less support for US equities – note that weak breadth has been a negative signal for both the market and Tech vs the market historically. The fact that Tech is so large and that Tech represents such a large proportion of the ‘winners’ i.e. 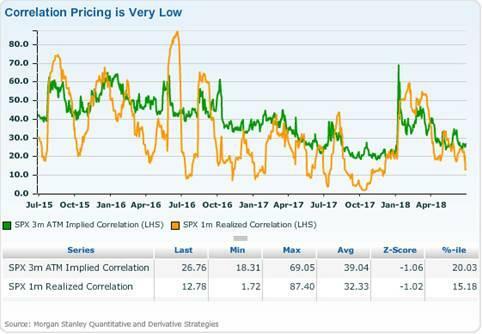 the long side of momentum makes contagion from a positioning unwind more likely now than in 2015, 16, or 17. 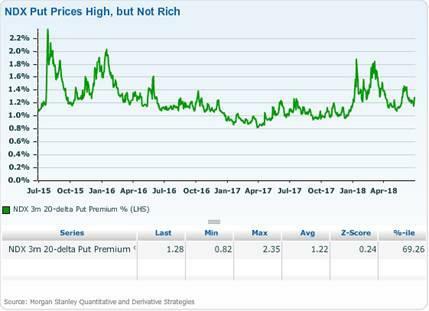 Tech is a potential market issue because it represents the intersection of so many different investor types, including fundamental HFs, quant HFs (who tend to have a momentum bias), and active mutual funds. 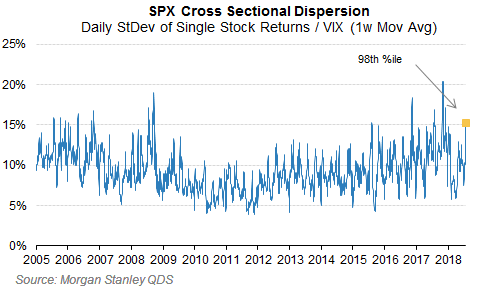 So far the moves over the last few days have driven dispersion to near historical highs (i.e. wide variation in performance across names). 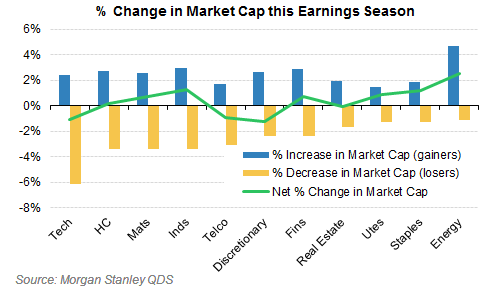 And overall drawdowns in the space have been mitigated by the fact that gains in parts of Tech have added ~$100bn in market cap to offset $200bn in market cap losses from the decliners this earnings season. 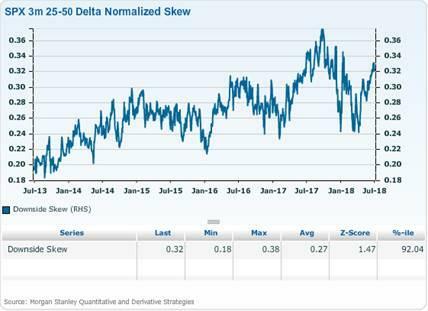 But the drawdowns in some names mean pain is being felt for at least some funds, and the risk is that investors across the spectrum de-risk more broadly, taking correlations between stocks higher.